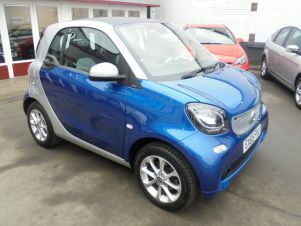 Find the perfect Smart car today at Carsnip. We’ve got over 1,412 used Smart vehicles available, and our intuitive search system means that you can make the best decision in the easiest way. We’ve made buying your next car easy. Browse over 1,412 vehicles below. If you live in a busy, congested city, a Smart car is a smart choice. The German manufacturer specialises in tiny vehicles whose compact size makes them perfect for city driving. With an amazing turning circle and an ability to fit in the tightest of parking spaces, it’s not hard to see why. The Fortwo is the smaller variation – unsurprisingly with two seats. It’s a rear-engined vehicle, with low emissions and cheap running costs furthering the appeal of it as a city car. The Forfour is the bigger car, with four seats and a slightly larger boot. 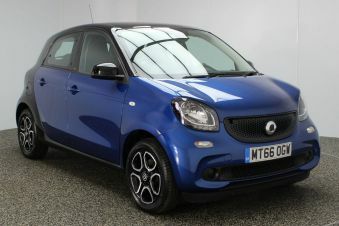 Across the Smart range, their unique looks are undeniably appealing.